Considered one of the Holy Grails of digital art tools by some, the Wacom Cintiq can be a joy to work with and often improves productivity when compared to regular pen tablets. The one-to-one pen-to-screen ratio and direct interaction make for a much more natural experience, particularly for those with a traditional art background. Like all tools, however, a Cintiq requires some adjusting to. The glass starts off sticky, the screen can get hot, your hand covers up menus, and fingerprints collect on the screen. Here are some tips I've found for addressing those problems, as well as a few more suggestions to help get the most out of a Cintiq. You may have heard about SmudgeGuard® while researching Cintiqs. Originally designed to prevent pencil smudging and graphite buildup on your hand, SmudgeGuard® has become popular with Cintiq owners because it prevents sweat and oils from your hand from building up on the Cintiq's screen, allowing your hand to glide smoothly and evenly over the glass. Wearing a glove also seems to alleviate discomfort caused by heat buildup from the LCD screen. Before getting a SmudgeGuard myself, I used a cheap cloth glove which I cut up to serve the same purpose. The glove wasn't pretty but it got the job done. 2.) 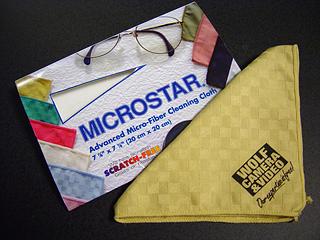 Buy a Micro-fiber Cloth. Despite wearing a glove, smudges and other marks will still work their way onto the glass. The safest and easiest way to wipe away smudges is with a micro-fiber cloth - a cloth with very fine synthetic fibers. I recommend buying a micro-fiber cloth designed for camera lenses or computer screens, as they're designed to protect very expensive pieces of equipment. Just make sure that no grit is on the cloth or the screen before you wipe it down, to prevent scratches. 3.) Left-Handed Pointers for Right-Handed People. One problem I noticed when first using my Cintiq was that the pen stylus covered up the default screen pointer for Windows. You might think that a pointer would lose it's importance when using a Cintiq, but, due to the slight gap between the glass and the LCD, the distance between the pointer and the tip of your pen grows as you move towards the edges of the screen. This offset in position means that you cannot simply rely on the tip of your pen to know where you are clicking and must instead keep your eye on the pointer. 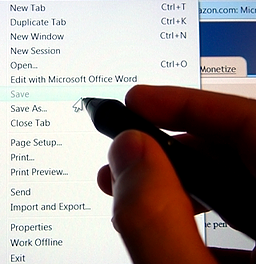 To relieve myself from having to lift my pen in order to see the screen pointer, I decided to download and install left-handed pointers from Microsoft's website (link). Now I always have a clear view of the pointer, no matter where my pen is positioned. 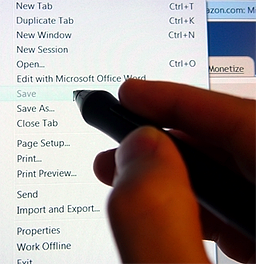 Similar to the pointer problem discussed above, the default direction that drop-down menus open can cause a problem for right-handed people when using a Cintiq (by default, drop-down menus open to the right, meaning they will appear beneath a right-handed person's hand). 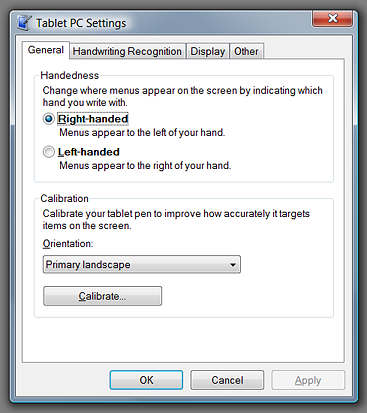 Fortunately, if you have at least Windows Vista, you can change the direction that menus open by setting the 'Handedness' in the Tablet PC Settings (click 'Start', type 'Tablet PC Settings', then select it above). If you set the 'Handedness' to 'Right-handed' then the menus will appear to the left of your hand instead of underneath it (if you're right-handed). Unfortunately, some programs, like Adobe Photoshop, seem to override the Tablet PC Settings for 'Handedness'. Most programs, however, will obey the setting. 5.) Manually Adjust the Pressure Sensitivity. One of the best tips I've read for Wacom tablets in general is to manually adjust the pressure sensitivity of your pen to a lower maximum setting. Doing so means that you won't have to press as hard with your pen to reach full pressure. For a Cintiq, this means less worry about scratching the screen and less money spent buying new pen nibs (since they will wear down slower). The newer drivers allow you to lower the maximum pressure to around 75%. To go even lower, you'll have to hack the preference file (I lower mine to around 50%). An article on how to manually adjust pressure sensitivity can be found here: http://cartoonwolf.livejournal.com/32779.html. I've been using the same felt nibs that came with my pens for a few years now, since I use very little pressure when drawing. 6.) Consider Buying an LCD Monitor Arm. While the larger Cintiqs come with adjustable stands, even more comfort can be gained by purchasing a high quality LCD monitor arm. Monitor arms, like the Ergotron LX Desk Mount , allow a full range of movement, letting you easily push the monitor away, straighten it for typing, or lower it into your lap for sketching. A good LCD arm may seem like a luxury but the comfort it affords can improve productivity by helping posture, allowing you to work comfortably for longer periods of time. Assuming you have the original box for your Cintiq, you already have most of the materials to make a simple protective cover for it. 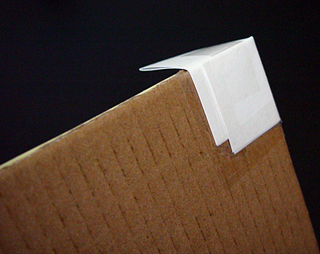 Using the pre-cut cardboard and paper that protected the screen in the box, I simply taped the paper to the cardboard and then made box corners out of index cards, which I then taped to the top corners of the cardboard. Now I can easily cover the Cintiq when I'm not using it, protecting it from any careless horseplay in the room. 8.) Consider Buying an Art Pen. If you bought a Cintiq because you're trained in traditional art tools, chances are you'll like the Art Pen. Though steep in price, the Art Pen detects pen rotation, allowing for more dynamic and realistic brush strokes in programs like Painter, Photoshop, and Manga Studio. Photoshop's new Bristle Brushes, in particular, produce very real stroke variation when using the Art Pen. Though a Wacom Cintiq is a big step up from a regular pen tablet, Cintiqs still have a few problems of their own which require adjusting to. Many of the tactile problems can be solved by wearing a soft glove, like the SmudgeGuard®, and on-screen problems such as pointers and drop-down menus appearing under your hand can be solved by changing Windows system settings. A micro-fiber cloth is handy for cleaning the screen, and an LCD arm can improve productivity by helping posture. To protect the Cintiq when not in use, a simple cover can be made from the original packaging, and adjusting the pressure sensitivity of your pen can save money on pen nibs. Finally, buying an Art Pen to get the most out of your Cintiq is worth consideration for those working in Painter, Photoshop, or Manga Studio. Having an LCD monitor arm can help you save space which is normally occupied by your computer monitor. It also adds to the beauty of your work space. I have a 22 HD CINTIQ and all you said is right. You bring us very good tips. The bigger problem I`ve seen is that it gets very warm, but the glove can be a excellent solution. Good article.